When the Toronto-Dominion Centre opened exactly 50 years ago, our city was a much different place than it is now. 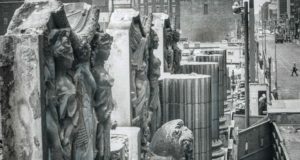 Even though it’s the last word in modernity, the TD Centre was built in a time when men wore hats to office, the majority of women were relegated to secretarial pools and hiring a Jewish person or a person of colour in a predominately WASP working environment was seen as highly suspect. 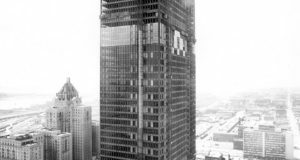 Over 100 buildings were demolished to built the TD Centre. There is a scale model on display of the original 1912 bank building in the present TD Centre banking hall on the SW corner of Bay and King. Most skyscrapers here in Toronto up to Mies’s arrival were gigantic mountains of stone, with massive entryways built to make you feel you were entering either Greek Temple or an art deco styled Hollywood palace. The TD Centre was constructed using only the best materials and sans any exterior decoration. The TD Centre’s official opening July 1, 1967-to coincide with the Canada’s Centennial. 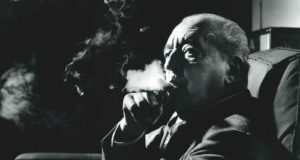 Architect Ludwig Mies van der Rohe (Mar 27, 1886 – Aug 17, 1969). 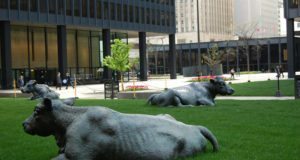 The 7 full size bronze cows designed by Joe Fafard. Some majestic bits and pieces of the original Bank of Toronto can still be seen out at Guildwood Park. What is so fascinating about the TD Centre is that while—thankfully—the old hiring ways are no longer with us, the TD Centre looks pretty much the same as it did when it first opened in 1967 when elevator etiquette required a man to remove his hat but not put out his cigarette. 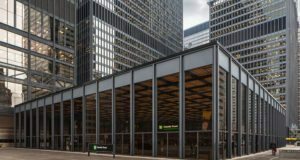 What makes the TD Centre a modern masterpiece of art and design is down to the genius who created it: Ludwig Mies van der Rohe, a German-born American architect (b. Mar 27, 1886 d. Aug 17, 1969). He was Mies (pronounced Mees) for short. The TD Centre was the brainchild of Allen Lambert, former president and chairman of the board of the TD Bank and Phyllis Lambert (his sister-in-law and daughter of Seagram’s chairman Samuel Bronfman, who was the one who suggested Mies as design consultant) along with architects John B. Parkin and Associates and Bregman & Hamann. The Fairview Corporation was the developer. 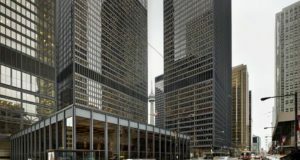 Even though the law required that a Canadian architectural firm had to be signed on as lead architect, the TD Centre is all Mies. In 1958, Lambert had previously hired Mies—that time in collaboration with American-born Philip Johnson—to build the Seagram Building on Park Ave. in New York City. And just like the TD Centre did here, the Seagram Building changed the skyline of Manhattan forever. Until Mies’ arrival, most skyscrapers here in Toronto uwere gigantic mountains of stone, detailed with granite gargoyles and marble finials amid massive entryways built to make you feel you were entering either a Greek temple or an art deco-styled Hollywood palace. Some modernist architects like Mies could appreciate the merits of early 20th century architecture—but he believed that less was more: modern buildings (if constructed using only the best materials, sans exterior decoration and stripped down to their bare bones) could hold their own as the next wave of architecture. And that’s why I love the TD Centre. Its public spaces still have the all the original furniture and light switch covers that Mies had designed (even though his elevator ashtrays have since been removed). Another lasting component of Mies’s fearless vision is that fresh-cut yellow daisies in clear glass round vases are still placed throughout the main banking hall with matching arrangements up on the 54th floor in the CEO’s office. He wanted his buildings to be organic, with a natural link between the customers on the banking floor and the big boss man upstairs. As Mies often stated, God is in the detail. 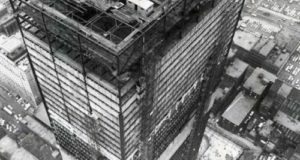 One of the great legends of Mies tells that just before the TD Centre’s official opening July 1, 1967—which coincided with the Canada’s Centennial—he went around with a screwdriver and lined up all the screws in the board room on the 54th floor so they would all be vertical. True or not, it shows how myth can enshrine certain architects as if they were movie stars. When the TD Centre went up, it created breathtaking vistas when seen from both afar and up close. It became the symbol of the new Toronto: wealthy, powerful and full of promise. We now had the largest, tallest and biggest corporate office space in all of Canada and it had been designed by the coolest architect in the world. 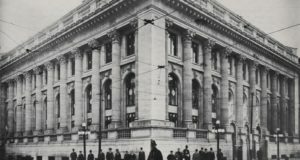 However over 100 buildings were demolished to create this urban paradise—including one of the most spectacular buildings in our history, the Bank of Toronto. It had been designed in 1912 by the illustrious architectural firm Carrère and Hastings of New York City, who could have been called the Mies van der Rohe of their day. 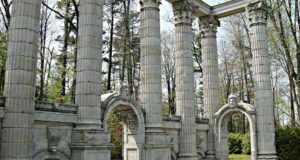 Bits and pieces of the majestic Bank of Toronto can still be seen out at Guildwood Park. A scale model remains on display in the present TD Centre banking hall. Mies also designed a 690-seat movie theatre (only one of two theatres that he ever built in his career) that was once part of the TD Centre’s lower concourse. It was abandoned in 1978. Some say the TD Centre casts too much of a dark shadow over the Downtown core and that with the wind tunnel it creates it’s hard to maneuver through it’s canyons on all but the calmest days. And yet its massive black steel-and-glass grouping of five towers (two more towers were added to the original three after Mies’s death) floats on a human scale, surrounding a plaza that was dubbed Oscar Peterson Square in 2004, complete with a grass pasture which is home to seven full-sized bronze cows designed by Joe Fafard (which—on purpose or not—marks out the location of Toronto’s first theatre the Royal Lyceum which entertained the city from 1848 to c. 1883). Sometimes when I find myself wandering through the TD Centre’s cow pasture in the quiet of the early evening I can’t help thinking of being out in rugged cattle country, engulfed by an immense chasm created by the looming TD Centre, a superb substitute for a breathtaking Western valley. With the sun reflecting off the golden RBC tower across the street, it becomes a perfect mix of old Hollywood meets modern Bay Street. Photo 3-Most skyscrapers here in Toronto up to Mies’s arrival were gigantic mountains of stone, with massive entryways built to make you feel you were entering either Greek Temple or an art deco styled Hollywood palace.